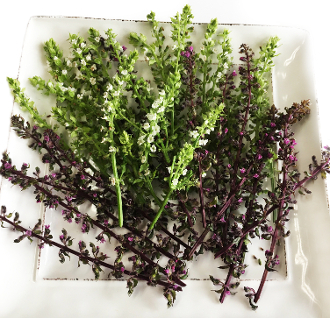 A mix of 4" long green sprigs with white flowers and dark purple flowers with matching leaves/stem. Herbal, sweet fragrance, remeniscient of mint. Add a unique fresh flavor to salads. A Japanese herb, this lovely flower is a perfect addition to Asian entrees and desserts.